by Gurmukh Singh. British Columbia Books, BC, Canada. Pages 208. Rs 999. The four Sikhs who landed in San Francisco on April 5, 1899, were the precursors of a wave that reached near its crest a century later. Indians were considered white, but suffered the same discrimination as blacks in the US a century ago. At one point, they were good enough to serve in the US army, but not to be citizens, as Bhagat Singh Thind found out. He was granted citizenship in 1920, but it was taken away from him on February 19, 1923. Indian pioneers, mainly Dalip Singh Saund of California and J. J. Singh Wallia of New York successfully lobbied to Congressmen, especially Congresswomen Clare Boothe Luce of Connecticut and Congressman Emanuel Cellar of New York, to introduce a Bill that would allow the US citizenship to Indian immigrants. It was in July, 1946, that President Truman finally allowed the citizenship to, but only a 100 Indians could be naturalised each year. Dalip Singh Saund was to become a Congressman eventually, the first Asian to be so. 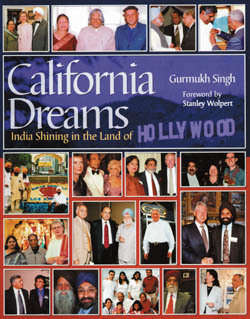 Gurmukh Singh has profiled the stories of Indians whose dreams came true in the land of Hollywood. By now an established chronicler of the Diaspora and the people who constitute it, the author has profiled many Californian stars. He takes you on a journey that celebrates the lives of achievers such as Dr Amarjit Singh Marwah, the veteran Indian American dentist; Vijay Amritraj, the tennis player turned sports promoter and businessman; and Dr Mohindar Brar Sambhi, who endowed a chair of Indian Music at University of California at Los Angeles. Of course, Pandit Ravi Shankar lives in San Diego, CA. Yogis down the ages who visited California or made it their home —Paramhansa Yogananda, Jiddu Krishnamurti, Maharishi Mahesh Yogi, Yogi Harbhajan Singh and Bikram Choudhary. California is also the home of new-age guru, Deepak Chopra. Hollywood has a long association with Indians, perhaps the earliest actor being Amritsar-born Lal Chand Mehra in the 1930s. Sabu, a child from Mysore, acted in 1937 in Elephant boy. Women, too, made their mark; Kamla Devi and Persis Kambatta stand out; the latter being admired for her acting ability and having the distinction of appearing in comic book series of two rivals. Ashok Amritraj, Vijay’s brother, is CEO of Hyde Park Entertainment and the most powerful Indian in Hollywood, catering to mainstream American audiences. Kavi Raj, who chased his dream to California in the 1970s, is a veteran with over 200 appearances on TV and the big screen. Bicky Singh is as wedded to the Internet as he is to his religion, and finds similarities between the two. Prof Chand R. Viswanthan is a professor with many firsts to his credit; Joginder Singh Sidhu designed, in 1980, the smallest camera in the world; Dr C. Kumar N. Patel invented the carbon dioxide laser; Navneet S. Chugh became the Sardar of the (American) Bar with his legal prowess. His father, Mohinder Singh, has been editing India Journal since 1988. Dr Rajendra Desai launched Project Deaf in India, each life has many stories to tell—at times grainy family portraits and too much colour mar the slickness of the book, but that is what Indians in California are, a colourful group of achievers who also know how to make their presence felt.